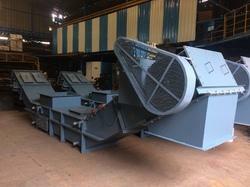 Pioneers in the industry, we offer wet scrapper conveyor from India. Material Handling Capacity As per customer's application. Type Horizontal & Incliened @ 30 Deg. at both ends. Conveyor Type Horizontal & Incliened @ 30 Deg. at both ends. Driven Type Helical Type, Geared Motor. Width As per design std. We are a leading manufacturer and service provider of wide range of Wet Scrapper Conveyor to our clients in Steel Sector, Power Sector, Sponge Iron Sector etc.